When junior Ashwini Iyer was in grade 7, she went to Tanzania with her father and a teacher to help orphans there learn math and English. That firsthand experience, she said, planted the seeds for her current volunteer efforts to empower povertystricken women and children from around the globe, and led to the founding of Harker’s Rising International Club. 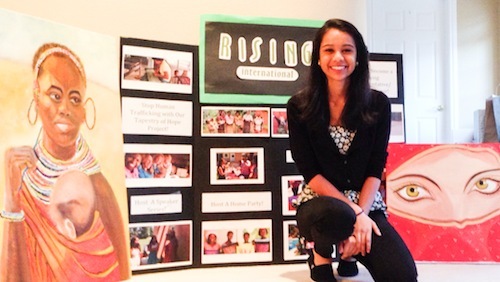 “Ever since then, I have been trying to find ways to give back and help those who are not as fortunate, without having to travel too far,” said Iyer, founder and president of the the club, which is one of several local chapters of an international nonprofit by the same name whose mission is to help end world poverty. On March 30, Iyer, with the help of schoolmate and club vice president Roshni Pankhaniya, grade 11, hosted a home-based fundraising event attended by about 60 Harker students and parents, as well as neighbors and family friends. All proceeds from the event, which totaled $4,226 (with more donations expected to flow in from people who could not attend but wanted to donate), went directly to the organization. For more information about Rising International, go to http://www.risinginternational.org.